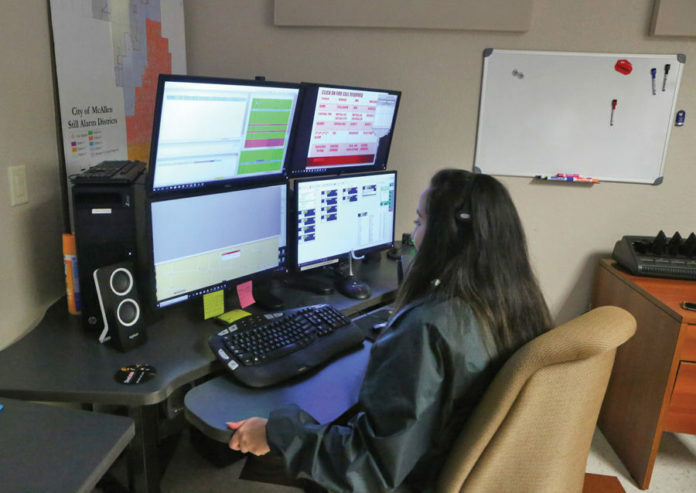 Emergency Communications Specialist Claudia Esquivel works at the new McAllen Fire Department 911 call center at the McAllen Fire Department Central Station on Thursday, Sept. 20, 2018, in McAllen. McALLEN — It wasn’t your typical ribbon-cutting ceremony: In order to mark the grand opening of the McAllen Fire Department’s Emergency Communications Center on Thursday, together the fire chief, city staff and dispatchers ceremoniously disconnected and reconnected a large industrial electricity plug. The center has been open since July 2, 2018, marking the first time since May 2012 that calls for fire service are routed directly from the city’s public safety answering point (PSAP), housed at the McAllen Police Department, to the city’s central fire station on North 21st Street. Over the past five years, the city contracted with the city of Pharr for fire dispatch services, a contract that was authorized with the belief that Pharr’s emergency communications center would one day become regionalized with the county’s other cities, a vision that never panned out. In 2017, McAllen paid Pharr $150,000 for this service, according to The Monitor archives, and the Pharr call center received more calls from McAllen than it did from within its own city limits. This money will now go toward covering staffing costs for the McAllen Fire Department’s own emergency communications center. The center was first established at the city’s old central fire station in 1968 and housed there until the mid-1990s, when the city combined its police and fire communications center at the police department, Balderas said. In a nod to the center’s history, a recreated photograph of a recently hired dispatcher answering a call hangs next to a photo from 1968. “We hired a young lady who looks like the one in the original photo,” Balderas said with a smile. City Manager Roel “Roy” Rodriguez said the new communications center emphasizes the importance the city places on public safety.